A quick card, created for last week's CAS 200th Challenge Celebration. The challenge was to use one of our oldies but goodies. This is one of my favorite Stampin' Up! sets, from years ago, combined with the burlap background stamp. Two of the few that I kept after stepping down from being a demonstrator. Hi there! Today I'm here to share a darling new stamp collection from Sweet 'n Sassy. It's a collection celebrating adoption! This is definitely a topic that is near and dear to my heart. Not because I have adopted children (although I would in a heart beat if it wasn't so expensive!) but because I have a number of friends with wonderful adopted children that I love dearly. There are so many children who need homes...and it's a tremendous blessing when one finds loving parents to raise, love, and care for them. This set is stock full of amazing sentiments, I wanted my card to focus on one of my favorite sayings in the set. And when I think of sentiments on cards, I think of Joanne B. Yes...I channeled Joanne for this card! (I wonder if she knows that I always think of her when I think of sentiments as the focal point on a card...she's the queen of making great sentiment cards!) 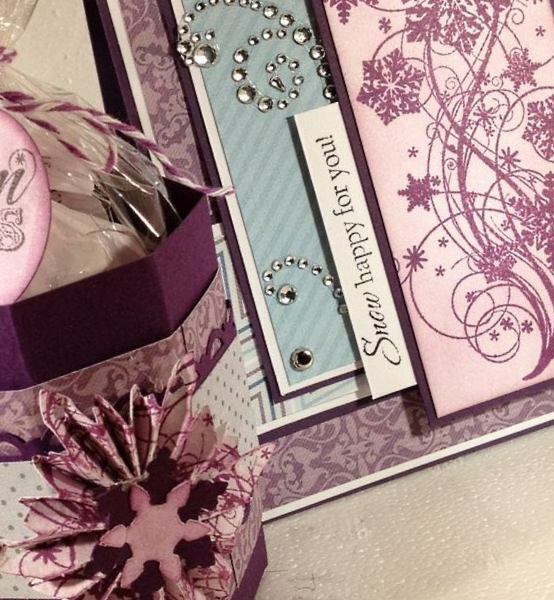 I love her use of kraft cardstock too...So Joanne, thank you for the inspiration! Since I was using a sentiment as my focal point, I wanted to dress up the card with pretty designer paper and the Farm Girl paper line from October Afternoon was perfect! I got busy cutting lots of layers and digging out this sweet MFT die, Layered Label (isn't that fun die?!) Then after I stamped the sentiment, I added some faux stitching with a Distress Marker, added some little flowers, a few brads, and some bling. Enjoy today's card and be sure to check out the Sweet 'n Sassy blog for more details on ordering this wonderful set! Oh my poor blog...it's been far too neglected! I love, love, love running eclectic Paperie but I do miss having more time to craft! I'm trying to actually schedule some time so I can set aside a quiet (quiet? I love with two young boys...there's no such thing as quiet! LOL!) time to just have fun. Last week I had that opportunity to decided to create a few cards for the 200th CAS challenge on Splitcoast (you can still play along!). One of the posted challenges was to create a card using the Dazzling Diamond Dust technique. This is a technique where you cover a complete colored and stamped image with VersaMark ink and then emboss with iridescent ice embossing powder. The embossing powder makes the colors really pop. Love the look! The stamp I used is from Sweet Stamp Shop and is called It's Raining. I love the image with the set but I think I love the sentiment even more. It's just perfect encouragement for someone going through a hard time. Sometimes there isn't much to say but offering our support of just being there is helpful. Enjoy and find some time to make art today! My stint **sniff, sniff** with the Splitcoast CAS team has come to a close. The three months went by so quickly and was such an enjoyable experience. It was so much fun to work on creating truly clean and simple cards and I loved getting to the point where I was able to create cards quickly. Much different than my normal 'one hour per card' time frame! I started by embossing the flowers with clear embossing powder, then I used a blending tool and grey ink to cover the entire card. Next I stamped the leaves in grey and brown. Added my sentiment and red rhinestones to the flower middles. Loving these colors together and it was fun to pull out a stamp set I haven't touched in years! This is a combination of two sets from Papertreyink. I think the flowers are from one of the very first sets Nicole released. Fun to play with some of the first acrylic stamps I purchased! Today is the Great Gifts joint blog hop, featuring products and techniques from Sweet 'n Sassy Stamps, eclectic Paperie, and Technique Junkie Newsletter! Hop on over to the eP blog for all of the details! Today we're just one week away from the 200th CAS (Clean and Simple) challenge and next week there will be a big 'ol CAS party on Splitcoast! Mark your calendars and don't miss out! This week's challenge was a sketch challenge, which I love! The sample is just darling but...but...the main image was tilted and...umm...well...I have a hard time tilting my main images (I break out into a sweat when I go ahead and glue down a tilted main image!) Does that give you a clue into my personality? LOL! So besides keeping my main image straight, I stayed true to the rest of this week's sketch. :-) I did keep my card pretty clean and simple, using a piece of embossed cardstock at the bottom of the card and a simple square to highlight this darling image from the You & Me stamp set from Sweet 'n Sassy. I did stamp the Friendship Script stamp, also from Sweet 'n Sassy, in the background and popped up my peas and carrots. Then I just added this sweet checked ribbon and a button. Enjoy!